In my last post, I shared the demo and prep process for getting my laundry room ready to paint. In case you missed it, this required scraping wallpaper and removing carpet as well as lots of cleaning and prep to get the surfaces and space ready. Anywhoo, my painting started with the dated laminated cabinets. I knew I wanted them to be white and I didn't want to waste any time priming the surfaces before painting so I decided to use chalk paint. I have talked about my love for chalk paint before since it adheres to any surface and you don't have to sand or prime prior to painting. My only complaint is the cost. So I decided to try making my own chalk paint for this project. I turned to Pinterest for directions and then headed to the hardware store for Plaster of Paris along with a gallon of the store brand (cheap) ultra white paint in flat. I used a red solo cup for mixing and sort of "wung" it I put about an inch of Plaster of Paris in the bottom of my cup and then added some hot water and stirred well. Once I had a thick, smooth consistency, I added my white paint and again stirred well. I applied this to the cupboard doors using a combo of a bristle brush and a foam roller. I applied two coats, allowing the paint to dry in between. I sanded the doors lighter as chalk paint usually leaves a rougher texture and visible brush strokes. I also spray painted the cabinet pulls with black spray paint for an updated look. I am really happy with the outcome of my DIY chalk paint and have a ton left for other projects. I am thrilled with the updated look of the cabinets and at this point of the project, was very excited to continue to see progress!! Next, I painted the walls. I had half gallon of Behr Silver Drop on hand which I used for my main floor and entryway. I decided to use this for the walls (because I had it already and) because I wanted a light and airy grey. It was really easy painting the walls since the chair rail and trim had been removed so I really only had to cut in at the ceiling. Then I used a roller for the rest. I also had Behr ultra white semi gloss on hand so I put a fresh coat on all of the trim and chair rail which again was super easy since it was off the wall. I also painted the furnace/ hot water tank closet door and spray painted a spare set of pulls I had to match the cabinet hardware. Now that the cabinets, walls, doors and trim were all painted, it was time for the floor! I mentioned in my last post how it was important to work from the top to the bottom. This allowed me to be a bit careless about drips while painting the cabinets and walls since I would be painting the floor anyways. 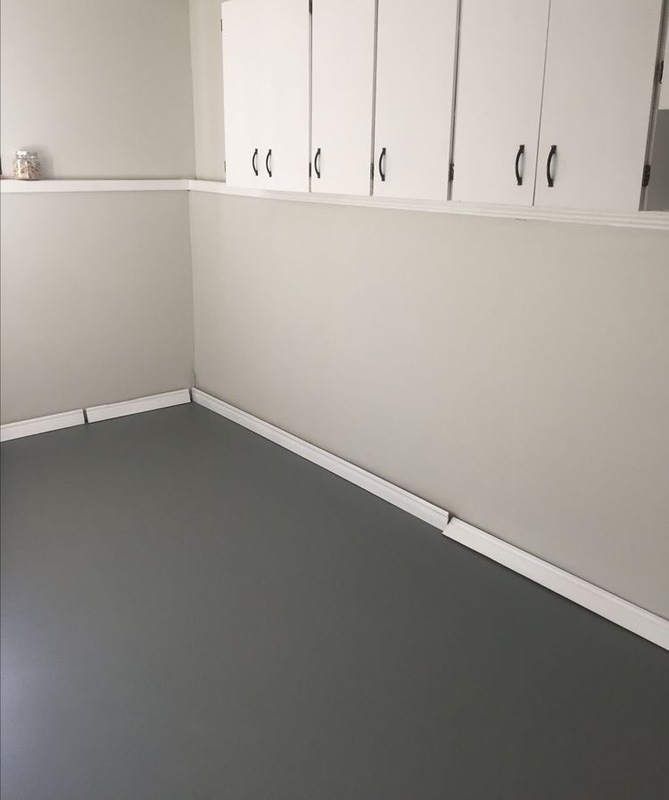 I did a bunch of research on painting concrete floors and ultimately decided to use Behr Porch and Patio paint in Slate Grey which is a pre-mixed colour. I could have chosen my own colour but I was already wanting grey with a slight charcoal/blue undertone and thought this would work well. I started by moving my washer, dryer and freezer out of the way and painted underneath each of them. I let this dry for about an hour and it seemed dry to the touch so I moved the appliances back into their place. I could have painted around them but they were easy to move and now the entire floor is painted. Painting a floor is literally the easiest thing ever!! I cut in with a brush but didn't have to be too careful since the trim wasn't attached. Then I dumped a small circle of paint on the floor and used by extendable roller to roll it out. I worked my way from one door to the other. Make sure you don't paint yourself into a corner! I turned my oscillating fan on and let this dry for about 2 hours. I was sooo pumped at how perfect it looked! 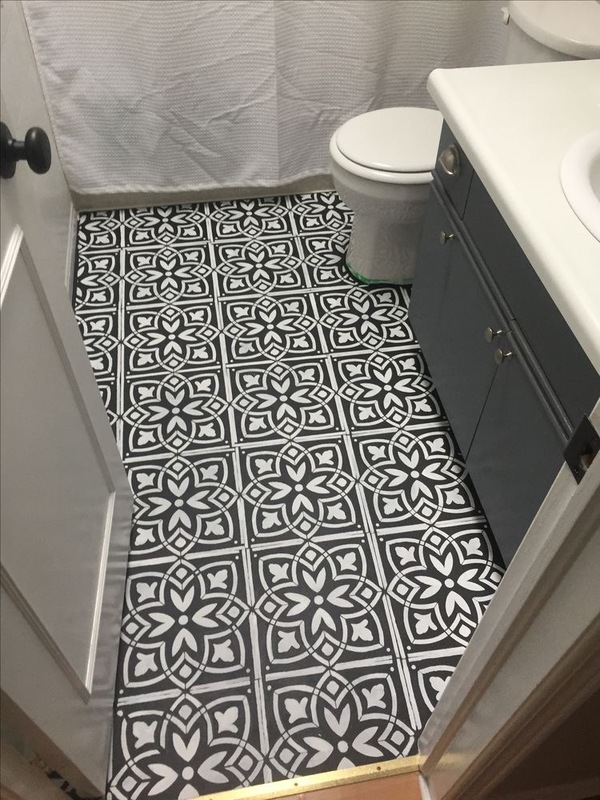 It obviously isn't perfect when you really inspect it, but for a laundry room basement floor I would say it looks pretty awesome! I didn't even do a second coat because I was so happy with the results of the first! I did a few touch ups with a brush where the roller hadn't completely covered a spot or crack. I purchased a gallon but a quart would have sufficed. Now I have lots on hand should I need to repaint it. I absolutely love how paint can transform a space like it did for this room!! Taking it from dark and dated to bright and fresh, it makes me so happy!! 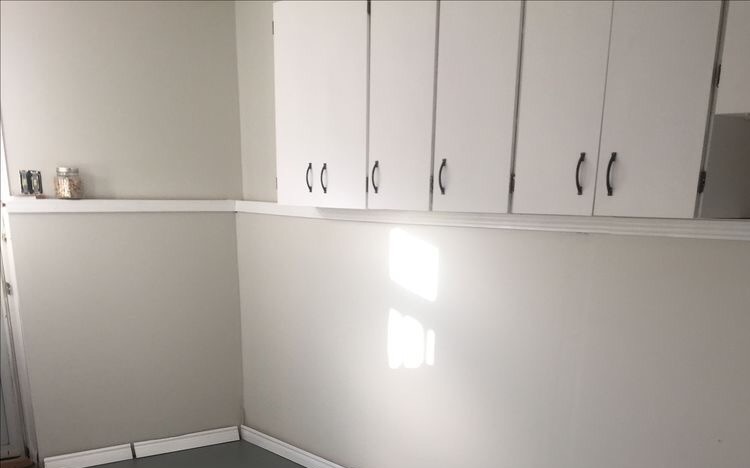 Although I did have some of the paint on hand when I started this makeover, I also purchased just over $100 worth of new paint for the cabinets, walls and floor with plenty leftover.